Meet the beautiful Indian Badminton player, who looks nothing less than a model. Ashwini Ponnappa is the girl who hails from Bangalore and she has become an inspiration for all the girls of the nation. She is smart, beautiful and also, she is a family person. 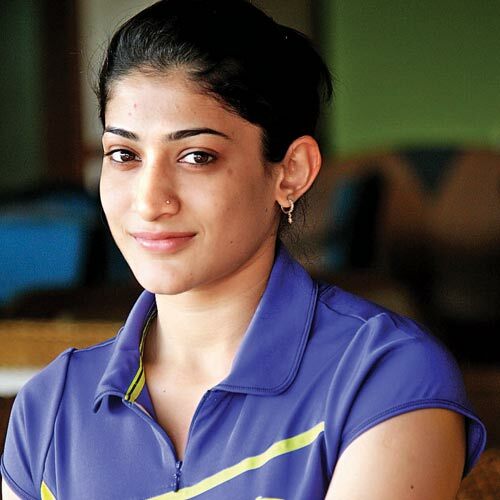 Born on 18th September, 1989, Ashwini Ponnappa is a young girl and she has turned several heads around with her fantastic performance in the badminton field and her good looks. She has represented the country several times in the International circuit. Her successful partnership with Jwala Gutta has proven to be fruitful. The pair has won many medals in various International level events. They received a gold medal at the Common Wealth Games and they also got the bronze medal at World Championships. Do you wish to know more about the beautiful Ashwini Ponnappa? Well, read on to find out about her early life and career. Ashwini Ponnappa belongs to Bangalore and she chooses to stay with her family. She comes from a family with a sports background. Her father was a hockey player. Ashwini loved badminton more than hockey and so, she took further training in the sport. She went to St. Francis Xavier’s Girls High School in Bangalore and later, she moved to Hyderabad to finish graduation. It was in the year 2004 when she received her first national title. It was in the sub junior’s doubles category. She won the same title in the year 2005 as well. She received the Junior Girl’s Doubles National Title in the year 2006 and 2007. She was determined that she wanted to pursue sports as her career. In 2010, she won a gold medal at South Asian Games. She paired up with Jwala Gutta and won the first ever gold medal for the nation. These two names have become immensely popular in every household. The two girls have made the country proud! In 2015, the pair won the gold medal at the Canada Open. This pair was the first to get a medal in the World Badminton Championship. The pair was the first Indians, who got a medal in this championship. Ashwini indeed loves Hyderabad but she chooses to be with her family. This shows that even after achieving success, she still wants to be stay close to her family. She cannot thank Hyderabad enough because it has given her a new life. She has been in the industry since 2007 and she is not willing to stop. Ashwini Ponnappa has proved to the world that girls can reach new heights. We have many women in the country, who are making us proud with their achievements in sports, science, technology and politics. If girls get the opportunity, they can inspire the world. Ashwini has a supportive family and she is doing very well in the sports field. This tells us that if women wish to excel in sports, dancing or any physical activity, they should get the opportunity. One should not hold stereotypical thoughts because women are born strong and they can touch the sky! This is an inspiring story for all the women, who are too scared to go after their dreams. Have the courage to chase your passion like Ashwini did!